The Corinthian is a 55-story apartment building that was New York City's largest apartment building when it opened in 1988. At 1,100,000 square feet (102,000 m) it is the biggest project of Bernard Spitzer, father of former New York Governor Eliot Spitzer. It occupies a full block between First and Second Avenues and between 37th and 38th Streets. It towers over the Manhattan entrance to the Queens-Midtown Tunnel. The Epic is a 615ft (187m) tall skyscraper in New York City, New York. It was constructed from 2005 to 2007, and has 58 floors. 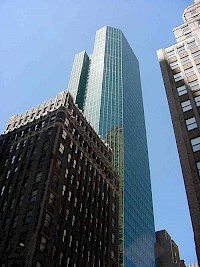 It is the 74th tallest building in New York, and has 460 rooms. 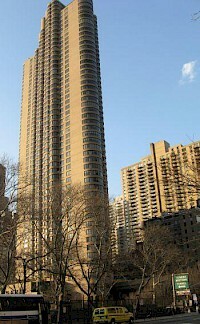 The Forum at 343 East 74th Street is a 25-story residential condop building located on the Upper East Side in New York City. 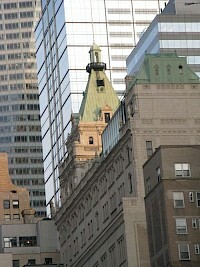 The building's location, midblock between First and Second Avenue on 74th Street makes the building visible from many parts of the Upper East Side. The building, which was completed in 1986, was opened to residents in 1987 and comprises 148 apartment units ranging in size from studios to three-bedroom apartments. The Orion is a skyscraper located in New York City's Midtown Manhattan area. The building rises 604 feet (184 m) above street level, containing 58 floors of residential units. Despite being only slightly more than 600 feet (183 m) tall, the residential building has dominated the 42nd Street landscape west of Times Square since its topout in September 2005. This means that the tower has views of New York City in every direction. The building was designed by the architectural firm CetraRuddy. 3 World Financial Center also known as American Express Tower, is one of the thirty tallest skyscrapers in New York City, located on West Street between Liberty Street and Vesey Street in Lower Manhattan. 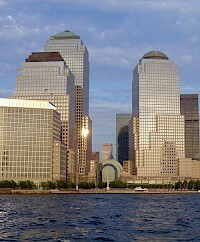 Rising 739 feet (225 m), the building is the tallest of the four buildings in the World Financial Center complex that stands in southwest Manhattan. It is similar in design to Two World Financial Center, except that its roof is a solid pyramid rather than 2 WFC's dome-shaped design. 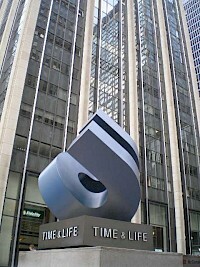 The Time-Life Building, located at 1271 Avenue of the Americas (6th Avenue) in Rockefeller Center in New York opened in 1959 and designed by the Rockefeller family's architect Wallace Harrison, of Harrison, Abramovitz, and Harris. It was the first expansion of Rockefeller Center west of the Avenue of the Americas. Air rights for the building were purchased from the Roxy Theatre to the west. The Roxy would be torn down in 1960 and an office building that is connected to Time-Life was built. 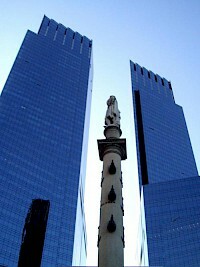 The Time Warner Center is a mixed-use skyscraper developed by The Related Companies in New York City. Its design, by David Childs of Skidmore, Owings & Merrill, consists of two 750 ft (229 m) towers bridged by a multi-story atrium containing upscale retail shops. Construction began in November 2000, following the demolition of the New York Coliseum, and a topping-out ceremony was held on February 27, 2003. The property had the highest-listed market value in New York City, $1.1 billion in 2006. Times Square Tower is a 47-story, 726-foot (221 m) office tower in Times Square in Manhattan, New York City, standing at West 41st Street. 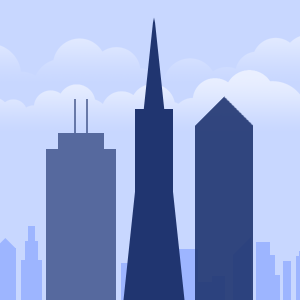 Started in 2002 and completed in 2004, the tower contains Class A office space. 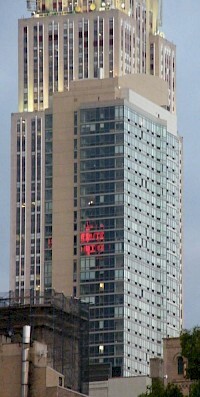 Some of the most prominent features of the Times Square Tower are its billboards, several of which hang on the building's façade. Most of the large signs are found near the base, but one 4-story sign is found above the middle of the building. Tower 49 is an office skyscraper in the Midtown Manhattan district of New York City. While nowhere near as illustrious as its neighbours at Rockefeller Center it is of principal architectural note because it provides an elegant solution to the problem of an irregular building lot. In this case the lot is fronted on both 48th Street and 49th Street between 5th Avenue and Madison Avenue. The street frontages were offset by about the width of an NYC brownstone lot on both sides.